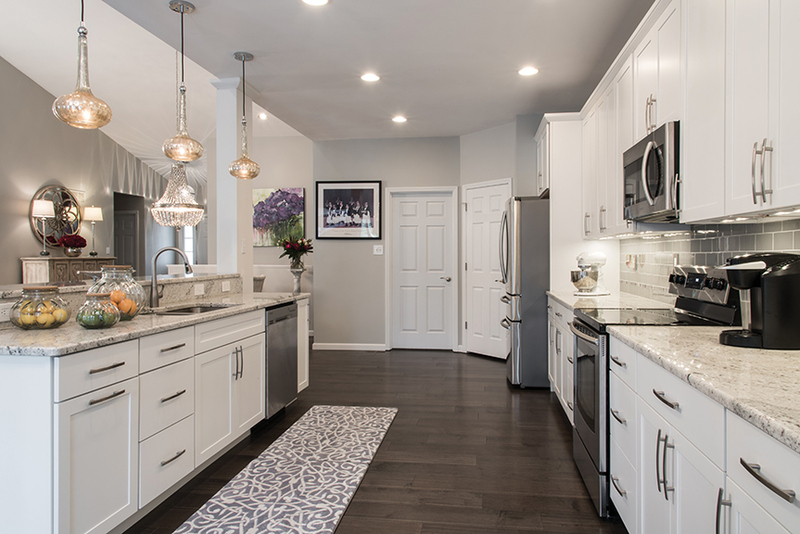 Pat Perotti put her stylish stamp on her typical builder-grade kitchen. Last year, Pat Perotti downsized from a large home to her mother’s recently vacated villa. Her villa was the same as her neighbor’s, which was the same as their neighbor’s and so on, but that was not Perotti’s style. She wanted to make her new home her own and give it a touch of her feminine class. 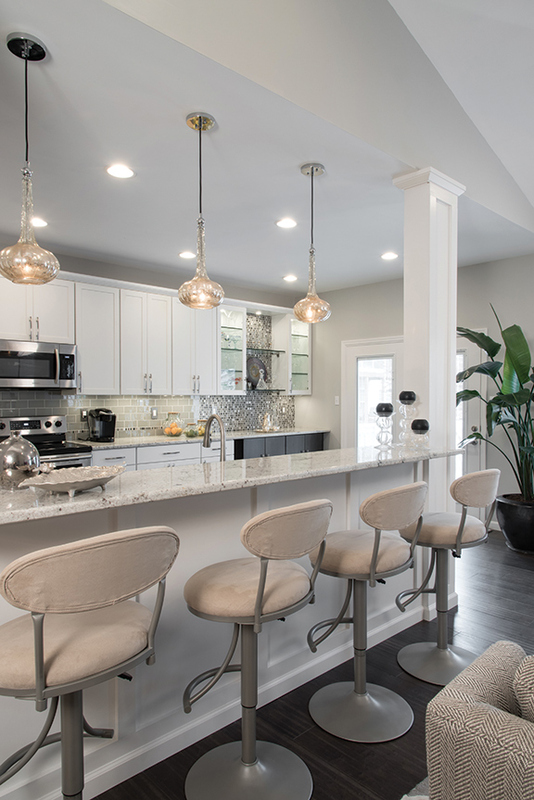 When she decided to re-do her mother’s old kitchen, she trusted interior designer Ellen Kurtz, of Ellen Kurtz Interiors, to pull off the new look. Perotti loves to entertain, and, being a dietitian, much of that entertaining happens in the kitchen. She wanted the kitchen to be a gathering place so she could see and talk with her guests while she cooks. However, a sizeable wall prevented this. Kurtz had the bright idea to take out the wall, opening up the space and letting in the light. Thankfully, the wall was not load bearing, and they were able to knock it out without any major issues. However, the neighbors would still check in occasionally to make sure their wall would not collapse too, as they shared a wall with Perotti. So to ensure there would be no structural issues down the line (and calm any and all fears), Kurtz added columns to the island to carry some of the weight. The breakfast room, dining room and kitchen are now one big room with plenty of space. For the latest look that kept a feminine touch, Kurtz used grays and magentas as the color scheme of the room. Completely gutting the old kitchen, she put in new flooring (a laminate engineered to look like wood with a sleek gray wash), a bar designed from cabinets (featuring a dark espresso wood on the bottom), new stainless-steel appliances, lighting pieces tinted with mercury, and glass cabinets – all of which accent the colorful pop of purple in the mosaic backsplash. The crystal chandelier over the dining room added that extra touch of femininity. 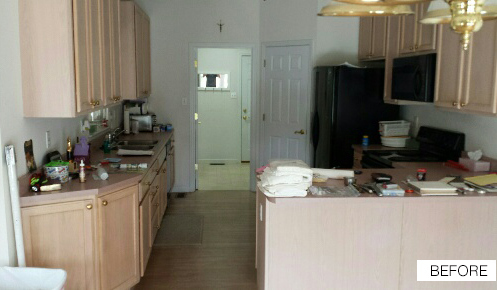 The only aspect of the kitchen that remained the same as before was the pantry. Since she’s completed the kitchen, Perotti has had all of her neighbors over and hosted her family’s Christmas gathering. The whole family loved the new setup, especially her grandkids. “Most of the work came from Ellen. She had the vision, and her designs turned out beautiful,” Perotti says. The duo was able to successfully transform Grandma’s old kitchen into a beautifully light and open new space ready-made for dinner parties and family gatherings.